The baby Sharktopus growing up in a SeaWorld-ripoff doesn’t escape the world’s notice, even if the proposed Sharktopus show isn’t ready for prime time. Dr. Symes notices and knows what Sharktopus is, and sets out to pay off the park owner to use Sharktopus to fight Pteracuda before anyone with authority figures out what he did. Thus the two monsters begin their battles, which happen sporadically, both monsters being off and on controlled by outsiders. It becomes obvious that part of the film is just dragging out the fight so the finale can’t happen too soon. 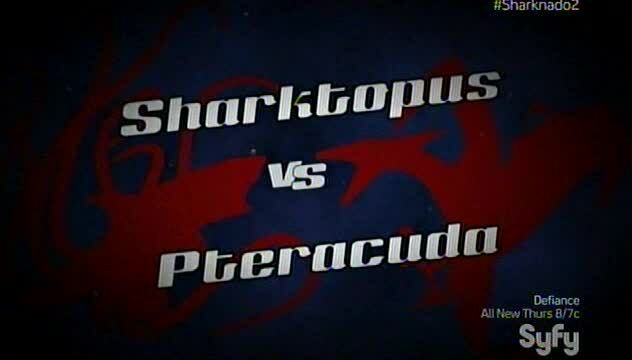 Sharktopus vs. Pteracuda was partially crowd-sourced, with potential monster names tossed out on Twitter by Roger Corman so people could vote. 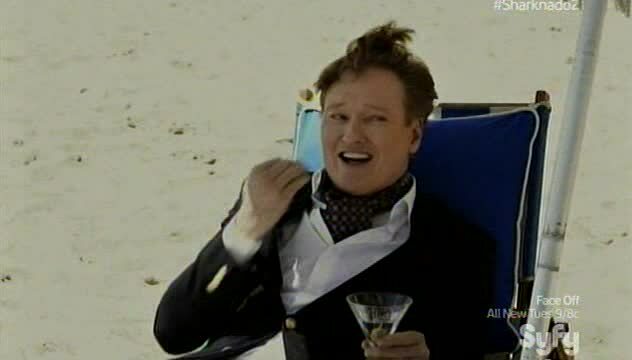 There is even a bit of gimmick casting, with Conan O’Brien appearing as a very arrogant Conan O’Brien before he gets Sharktopussed and turned into a volleyball. 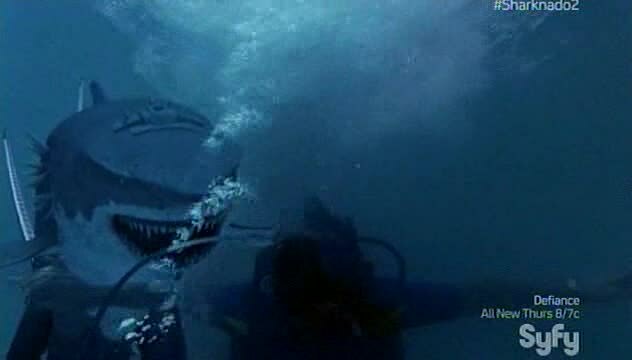 Then the film was aired the same week as Sharknado 2, which stole a lot of its thunder. 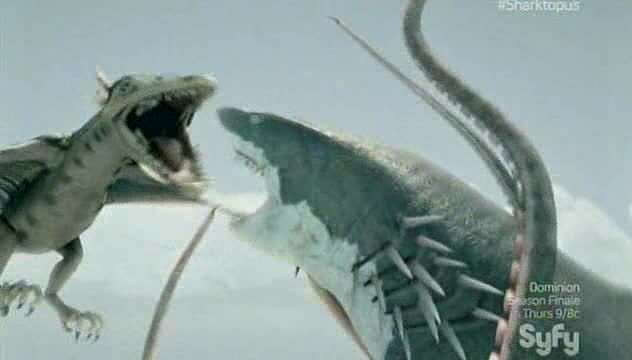 And Sharknado 2 is a superior picture, but that’s not to say Sharktopus vs. Pteracuda is bad, it’s just above average SyFy original creature feature. I enjoyed it, I won’t change the channel if it’s on, but I won’t be seeking it out. Fishing lures are getting more complicated all the time! Robert Carradine does an awesome job of playing a smug and backstabbing scientist who is just looking out for number one. 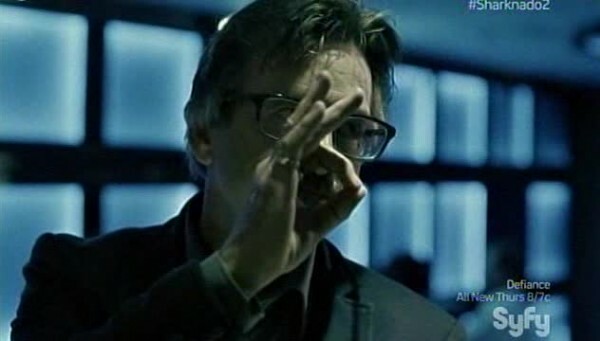 He practically steals the show on the human scenes with his immoral and scenery chewing villainy. He outright tells Ham that he’s not going to risk his neck, and runs off to safe places several times. His treachery becomes his undoing, as he burns all his bridges so there is no escape from creature retribution. Rib Hillis more sleepwalks through his character, hampered largely due to his characters lack of personality until near the end of the film. Katie Savoy does well with Lorena Christmas, someone who is obviously in over her head but still has the skills and experience required to help save the day. The worst performances are some of the supporting characters, the completely overacting rich American tourist couple just grated and grated every scene they were in, it took way to long to kill them off! Unfortunately due to all the outside control and other weird events, there isn’t much time for personality for the monsters. 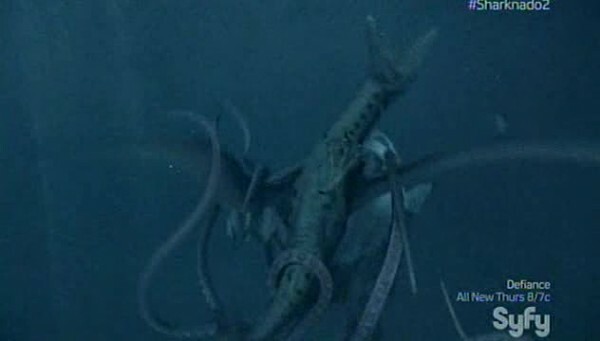 Sharktopus seems like it is smart and adaptive, but that’s never really used in the film. 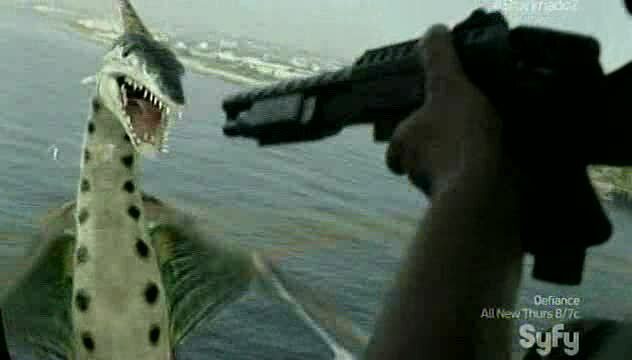 Pteracuda was designed as a weapon and just attacks attacks attacks. The scene where Pteracuda slaps Sharktopus is the only real time we see personalities emerge. It’s a shame, because cool monsters have personalities, and SyFy monsters almost never have personalities. Sharktopus will return in Sharktopus vs. Mermantula, which was filmed back to back with Pteracuda. 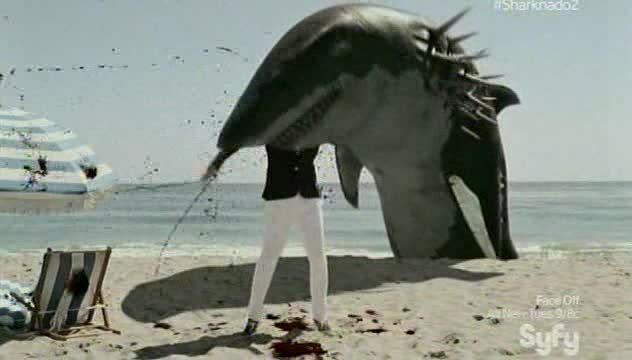 Hopefully we don’t have to wait for the third Sharknado film to get our fill of shark/octopus action. The Second Amendment gives citizens the right to bear arms! Someone is revenging against this nerd revenge! Did you know SCUBA is an acronym? Also I’m going to eat you! 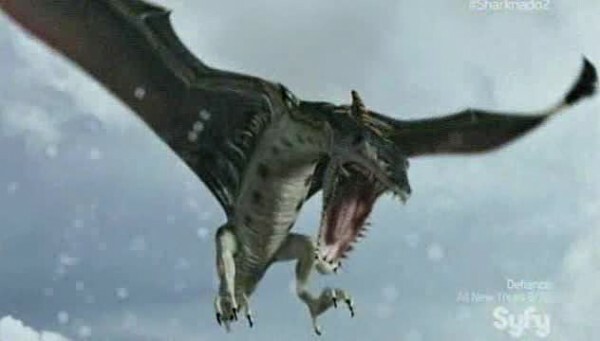 I’m not Rodan, dang it! Hi, my character seems like an addition used to create a loose narrative between the sequels, but that won’t be confirmed until the next movie! 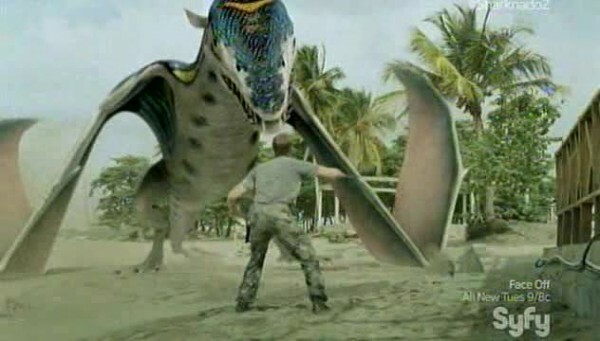 Ha, you walk stupid, Pteracuda! 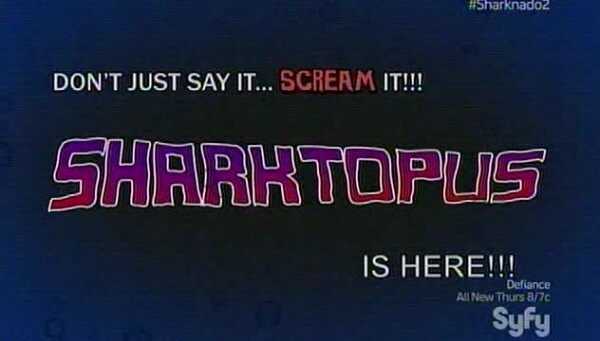 The only movie that advertises itself while watching itself!